The ClinScan MRI uses the Siemens MRI interface (Version VB15A) and electronics and thus facilitates translational research between preclinical and clinical research scanners. The University of Pittsburgh MR Research Center (MRRC) employs research-dedicated Siemens 3 T and 7 T human MRI systems that can run the same pulse sequences as the Clinscan. An IDEA/ICE compiler is located in the ClinScan lab for pulse sequence development and testing. The static magnetic field (B0) is 7 Tesla (approximately 140,000 times greater than the earth's intrinsic magnetic field) and has a warm bore diameter of 20 cm. The main magnetic field remains on even when the system is not being used for imaging. The main magnetic field is generated by superconducting wires (or coils) that are cooled by liquid helium. The liquid helium in the superconducting magnet is recycled and re-liquefied using a cryo-refrigerator. The system comes equipped with a BGA12-S HP actively shielded gradient coil (12 cm ID), with peak amplitude of 660 mT/m and peak slew rate of 4570 T/m/s) and room temperature resistive 1st and 2nd order shims. The gradient is water-cooled. Transceiver (i.e., transmit & receive) radiofrequency (RF) coils include a rat body circularly polarized (CP) volume coil (86 mm inner diameter, ID), a rat brain/mouse body CP volume coil (40 mm ID), and a linear dual-tuned rat body 19F/1H volume coil (72 mm ID). Receive-only RF coils include rat and mouse brain CP surface coils, an animal cradle with mouse body 8x1 phased array coil (35 mm long), and an animal cradle with a 2x2 cardiac phased array (32 mm long). The system is capable of supporting multi-nuclear spectroscopy and imaging (see gyromagnetic ratios). The system currently operates at Siemens VB15A. Advanced Siemens product pulse sequences on the ClinScan include 1H spectroscopy, constructive interference in steady state (CISS) and double echo in steady state (DESS), turbo gradient spin echo (GRASE), and diffusion tensor imaging (DTI). 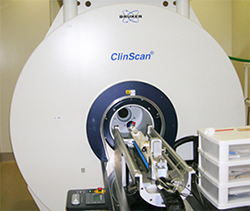 Click for a current list of ClinScan sequences and applications. Advanced imaging analysis tools include motion correction using 3D PACE for functional MRI (fMRI), advanced cardiac imaging, and ARGUS flow quantification. The system is equipped with an AutoPac automatic positioning system with RF shielding. Animal beds include a large (150 mm) rodent cradle, a split rat cradle, and a split mouse cradle. A Perkin Elmer FMT 2500 multimodality imaging adapter and animal cassette with fiducial markers permits co-registration of MRI with PET/CT and optical imaging systems. Isoflurane anesthesia is provided using a VetEquip RC2 Rodent Circuit Controller that provides accurate flows of 0.5 and 1.0 L/min of gas (O2 or air). Rodents may be placed on a Cwe Inc. MRI-1 MRI-compatible ventilator. A Flow Sciences Model FS 3915 anesthesia workstation is also available for animal procedures. Mouse and rat Broome restraints are available for tail vein injections. 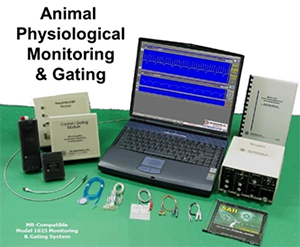 Animal physiologic monitoring and image gating control is provided through a SA Instruments Inc. (SAII) Model 1025 MR-compatible monitoring and gating system. The system can simultaneously monitor and record ECG, respiration, temperature, and blood pressure. Animals are warmed by air with a SAII rodent heater system that is controlled by the Model 1025 based on the animal's temperature. Isoflurane anesthesia is available to users. A 4-channel fiber optic thermometry system is used to monitor animal and bore temperatures. The PreClinical 7 T MRI Laboratory is staffed by an imaging researcher/programmer who possesses both programming and animal handling skills. The imaging researcher/programmer develops data and image analysis tools typically written in Matlab, and uses existing tools, both commercial and open source (e.g., FSL, Osirix, SPM). The imaging researcher/programmer also operates and maintains the ClinScan. A valid funding mechanism (grant or contract) with the University of Pittsburgh. An IACUC-approved protocol. Animal protocols must be approved through the University of Pittsburgh's Institutional Animal Care and Use Committee (IACUC). Magnet safety training. 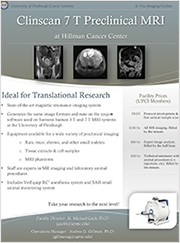 MRI safety training is available through the University of Pittsburgh or the PreClinical 7 T MRI Laboratory Director. University of Pittsburgh animal research training. Animal handling training, which is available through the University of Pittsburgh Division of Laboratory Animal Resources (DLAR). Screening for access to the magnet. A protocol meeting with the PreClinical 7 T MRI Laboratory Director.